Congregation Agudas Achim grew out of the B’nai Israel congregation in the early 1870s. Dissatisfied with the influence of the Reform movement on the congregation’s doctrine and liturgy, some members began to agitate for a return to more traditional services. The bid was unsuccessful, and the ideological divide soon led a number of B’nai Israel members to leave the congregation. In the fall of 1879, they initiated Little Rock’s first Orthodox services, held at Casino Hall. The founding members included prominent B’nai Israel figures, primarily of Eastern European descent. Samuel Lasker and Isaac Adelman, both Polish immigrants and successful dry goods merchants, helped lead the first services. For many years, the group continued to meet, occupying a series of rented spaces and stores around Little Rock. The increasing numbers of Eastern European Jews who arrived in Little Rock around the turn of the century tended to be more traditional and gravitated towards the Orthodox group. In 1904, the numbers grew large enough to establish a formal congregation named “Agudas Achim.” Samuel Katzenellenbogen, a Russian immigrant and Little Rock merchant, contributed both material and spiritual support for the fledgling congregation. His store on Sherman Street served as an informal meeting place for congregation members, and the group often held services in the back of the premises. He also served as the congregation’s first full time Rabbi, a position which he held until 1913 and intermittently thereafter whenever a Rabbi was unavailable. By 1908, the congregation had grown large enough to support their own synagogue. For a sum of $8,000, the group purchased a stone structure at Eighth and Louisiana Streets formerly occupied by the Second Baptist Church of Little Rock. The congregation also established a traditional Hebrew school cheder which met regularly during the week. By the 1930s the congregation also supported a Ladies’ Aid Society, a Ladies’ Sisterhood and a Men’s Club. The years following the Second World War brought significant transformations to Congregation Agudas Achim. In 1948, congregants began to raise funds for a new building to replace the aging stone structure. In 1949, Rabbi Samuel Fox assumed the pulpit, and led the initiative for the new building project. The new synagogue was dedicated on the third day of Chanukah in 1952, along with the restoration of the weekly cheder and a Sunday School. Although it offered modern facilities, the building sat on a busy downtown street corner far from the homes of many of the congregants. Those who attended by car had trouble finding parking and the rabbis who walked to services had to check into downtown hotels each weekend. The Civil Rights struggled that engulfed Little Rock in the 1950s also brought unwanted attention to the downtown synagogue. At the height of the crisis, Rabbi Groner bravely declared his support of integration, one of the very few Little Rock clergymen to do so at the time. In October of 1958, he received a threat that the synagogue would be bombed the following Friday evening, although the event passed without incident. In 1965, congregants purchased a second property at 7901 West 5th Street. In 1973, they sold the downtown building and installed a modular unit on the new property that would be used until a new synagogue could be built. On May 2, 1976 community members celebrated the dedication of their new sanctuary which continues to be used today. Soon after the congregation moved to its new building, there was debate over whether to institute mixed seating. Like other Orthodox congregations, Agudas Achim had always had men sit separate from women, but now there was a growing movement to enable families to sit together. Once the congregation decided to have mixed-gender seating, it no longer affiliated with the Orthodox Union. While their worship is still Orthodox in style, Agudas Achim is not affiliated with a national movement. In recent years, there has been some discussion about joining the Conservative Movement, but for now, the congregations remains unaffiliated. 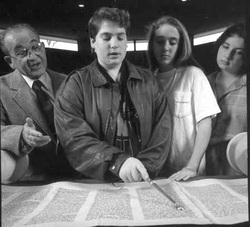 In 2005, the Little Rock Jewish Community celebrated Agudas Achim’s centennial. The Rabbis from B’nai Israel and Lubavitch of Little Rock spoke at the event, as well as Congressman Vic Snyder. Following the addresses, Rabbi Martin Applebaum conducted a service of rededication held to insure the congregation’s continued success. Currently, there are about 75 member families; some of these are also members at the Reform Temple B’nai Israel.